Marc and Dani were joined onstage by Tetsuhiro Kuwata (HRC Director – General Manager Race Operations Management Division) and Team Principal Livio Suppo for the official unveiling of RC213V that the team will race in the 2017 MotoGP World Championship. Also on stage were Astra Honda Motor executives including Toshiyuki Inuma (President Director), Johannes Loman (Senior Vice President), Morgono Tanuwijaya (Marketing Director) and Koji Sugita (Marketing Director). A partnership contract was signed by Mr Kuwata, Mr Inuma and Mr Loman. Four very lucky Indonesian fans, winners of a Repsol social-media contest based around the #MadAboutRepsolHondaTeam hashtag, had the exclusive opportunity to closely admire the RC213V and to meet and greet Marc and Dani before the riders left for the airport to make their return to Europe. 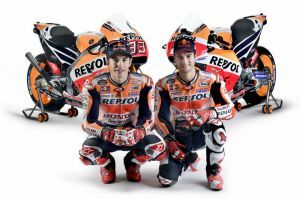 This was the third consecutive year that the Repsol Honda Team launch has been excellently hosted by Astra Honda in Indonesia. On the same occasion, AHM presented their own 2017 racing activities and officially launched the new Honda CBR250RR Repsol Edition, CRF250 Rally and CRF1000L Africa Twin.